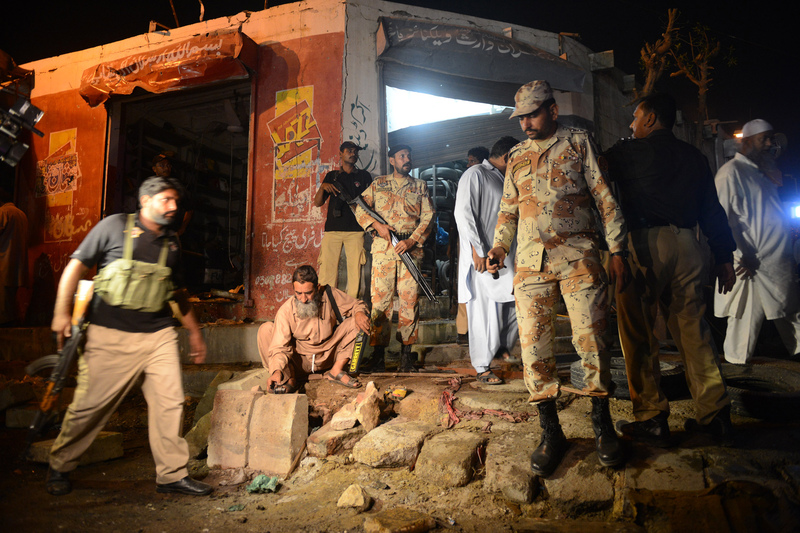 Security officials at the site of an explosion near a Shia place of worship in Karachi, 21 November. It has been a little while since I updated this site, so here are links to some of the things I’ve been writing for various publications. At the start of this month, a school in Lahore was burned down by an angry mob after a teacher was accused of blasphemy. This blog looks at the underlying issues of blasphemy laws and the extreme sensitivity of religious issues in Pakistan. Anusha, a 15 year old girl in Pakistan-administered Kashmir, died after her parents threw acid on her as punishment for looking at a boy. In the aftermath of this attack, I published this interview with Sharmeen Obaid-Chinoy, the director of Saving Face, the Oscar-winning documentary about acid violence. Tens of thousands of people in Pakistan have been killed in terrorist attacks since 2001. This blog reflects on day to day life in what is supposedly one of the world’s most dangerous places. This month is the holy month of Muharram, yet it has been marked not by religious reverence but by the heightened threat of sectarian violence against Shias. This piece looks at the recent history of persecution of Shias by militant groups. I’ve got a piece in the current issue of Grazia (not online) about acid attacks. It looks in more detail at the story of Anusha, the 15 year old killed by her parents. 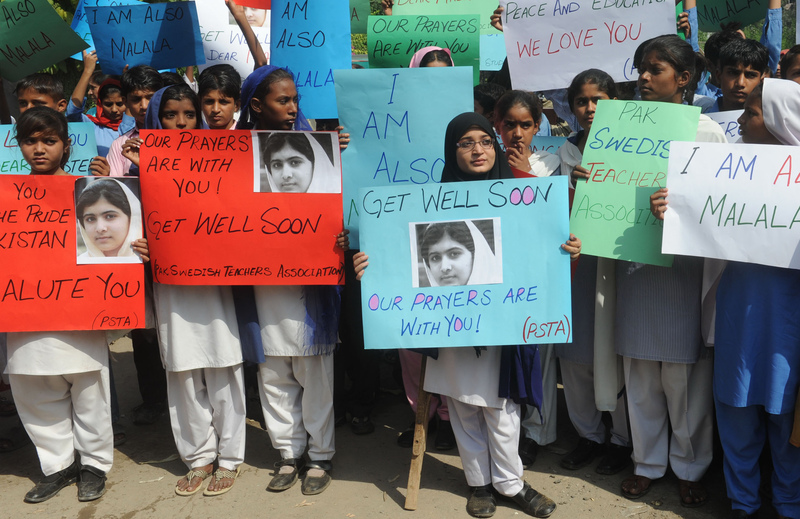 Children in Lahore protest against the attack on Malala. October 2012. Perhaps the most worrying aspect of this story is that the Khans have received absolutely no protection from the authorities. This is despite the fact that the Malala case powerfully highlighted how real the dangers are for women in these areas. If the state is not going to take action now, when the public mood is one of revulsion with extremism, will it ever do so? I also interviewed Hina for the latest issue of Grazia magazine. The piece isn’t online, but here are some excerpts from our conversation. After we left Swat and came to Islamabad, I found out schools were closed. So I did a press conference where I spoke about the Taliban and another where I spoke about education. I also led a protest demanding education to be made available. What kind of threats have you received? We didn’t report his to the police because we didn’t think they’d actually act on it. But after they attacked Malala, we realised the danger was actual. We passed on the threats and went public about the threats. The police chief went on TV and said they would protect me but there’s been nothing from them. They haven’t phone us or acted on it. How do you feel about what happened to Malala? I pray for her. I’ve been lucky. I began speaking out before her but she was the one who was attacked. I’m praying for her and want her to come back to her own country. She raised her voice. I am afraid. I don’t go anywhere. I’ve taken time off school/college. We’ve just had Eid but we stayed at home – we didn’t visit friends or relatives. We didn’t even got out and do our Eid shopping. I’m frightened of going out. But we won’t stop working towards what we want – what is right. 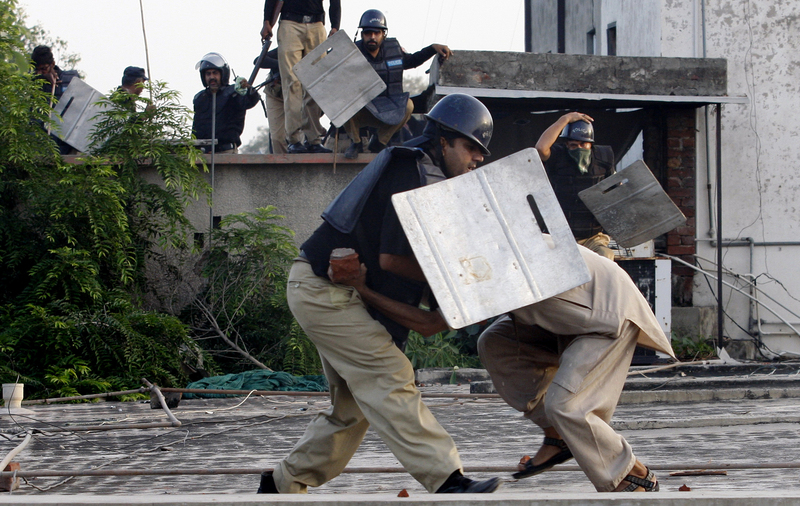 A policeman clashes with a demonstrator during protests in Lahore against the “Innocent of Muslims” film. YouTube has been banned in Pakistan since 17 September, after riots triggered by the “Innocence of Muslims”, an inflammatory clip on the video-sharing site. Last week, I wrote a short piece for the Independent about the ban. I’ve also covered the issue in more detail for Dawn. As the piece explains, the YouTube ban is just the tip of the iceberg, with the government using the unrest to usher in a system that would allow them to censor the internet on a wide scale.